Emily Carr & Linny D. Vine' "Silver Sky Magnolia"
with Emily Carr's painting,"Totem Walk at Sitka". (with the wall in between them). Plainly, Emily has my back. Happy Easter!! This is one of 26 paintings that are "From A to Izzard in Linnyland",(this year's title for my annual spring solo show at Fernwood's She Said Gallery). 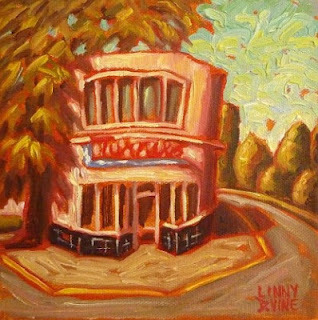 Linny D. Vine sells out at the Art Gallery of Greater Victoria show!! Linny D. Vine sells out at the Art Gallery of Greater Victoria reception yesterday!!! Thank-you to all the friends, art lovers & Linnyland collectors (near and far)who joined with me in yesterday afternoon's fun and celebration at the Art Gallery of Greater Victoria!! !